Cuttlefish belong to the Cephalopods. They are usually found in shallow watersand around reefs along the coasts of east and south Asia, western Europe, the Mediterranean, Africa and Australia. They are among the most intelligent invertebrates. Cuttlefish have an internal shell (the cuttlebone), large W-shaped pupils, and eight arms and two tentacles.They normally range in size from 15 cm to 25 cm. tThe largest species, The Australian Giant Cuttlefish (Sepia apama) grows to 60 cm in mantle length and over 10.5 kg in weight. Cuttlefish have two methods of swimming. They can jet propel themselves backwards by sucking water into their body cavity and then expelling it through a funnel. This produces a very rapid backward movement, which is usually used for escaping predators as it is needs a great deal of energy. .Hovering and normal swimming is achieved by gentle wave-like movements of their side fins. texture of its skin in the blink of an eye. This cuttlefish has turned red to display anger. Shot at night on the Great Barrier Reef, Australia. The cuttlebone is porous and is made of aragonite, a form of calcium carbonate. This provides the cuttlefish with buoyancy which can be controlled by changing the amount of air in the chambers inside the cuttlebone. 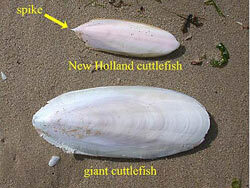 Each species has a distinct shape, size, and pattern of ridges or texture on the cuttlebone. Cuttlebones are often found washed up on beaches and are fed to caged birds as a source of calcium in their diets. 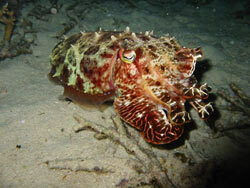 Cuttlefish live for somewhere between 18 and 24 months and the females die shortly after spawning. Mating cuttlefish place their bodies head to head so the male can transfer a sealed package of sperm into a pouch beneath the female's mouth. The female then finds a quiet place where she draws eggs from her cavity and passes them over the sperm to fertilise them. Cuttlefish attach clusters of around 200 eggs, coated with squid ink (sepia) which acts as a glue and also camouflages them. After 2 to 4 months the young hatch as tiny versions of their parents with a supply of yolk that nourishes them until their first catch of prey. The main prey for cuttlefish are small fish, molluscs, crustaceans (such as prawns and small crabs), octopuses, worms, and other cuttlefish. They usually feed at night. To feed, the cuttlefish shoot out, in a rapid whip-like action, two long feeding tentacles normally retracted in pouches under their eyes. On the end of eachtentacle is a pad covered in suckers. They eat their prey holding it with their arms. If they are feeding on an animal with a hard shell, they use their strong beaks to crack open the shell and their radula (tooth-lined tongue) for rasping away at the food. When attacked by predators(e.g. dolphins, seals, fish, sharks and other cuttlefish) cuttlefish can produce a cloud of black ink to confuses the predator, allowing the cuttlefish to escape. They can also camouflage themselves to hide from their predators, and to ambush their prey. This camouflage can be seen in the changing of colours and patterns, caused by a layer of chromatophores (tiny elastic pigment sacs) found just under the skin. are from a predator like dolphins, seals or sharks. Cuttlefish are caught for food mainly in the Mediterranean, East Asia and the English Channel. In East Asia dried, shredded cuttlefish is a popular snack food. In Italy it is used in Risotto al Nero di Seppia (the rice turns black because of the cuttlefish ink used in cooking it). Many Spanish dishes such as rice, pasta and fish stews, especially from coastal regions, use cuttlefish and squid ink for the marine flavor and smoothness they provide.